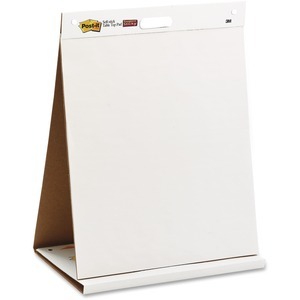 Tabletop easel pad features a built-in stand to allow quick setup anywhere for tabletop presentations, small group meetings or team brainstorming sessions. Convenient carrying handle provides a secure location to grip the pad for easy transportation from room to room. Self-stick sheets can be applied to walls and remove without any damages. Sheet Size : 20" x 23"